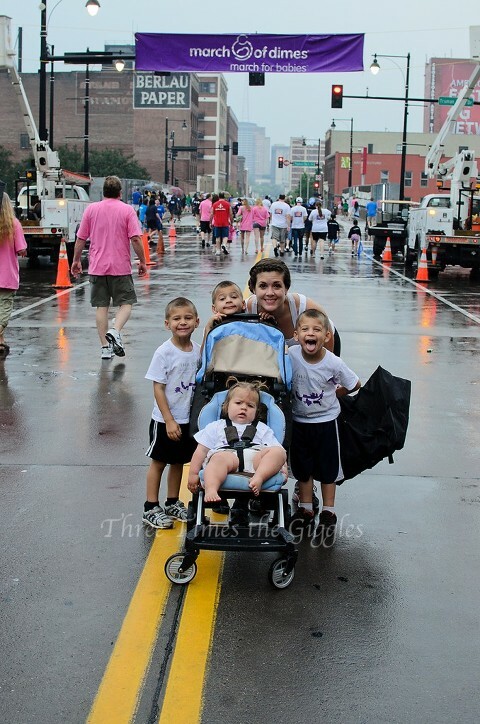 Yesterday was a crazy weather day, and of course it also was the same day as the Kansas City March for Babies! I probably shouldn’t have remarked a couple of days before about how it would finally be warm for a walk, instead of on the chilly side like it’s been each of the previous 4 years. Silly me! As we were walking towards our meeting spot for our team, I felt the first few drops, and then it poured. Boo! After 15 minutes of being crammed under a tent with a few hundred of my closest friends, it cleared up a bit. 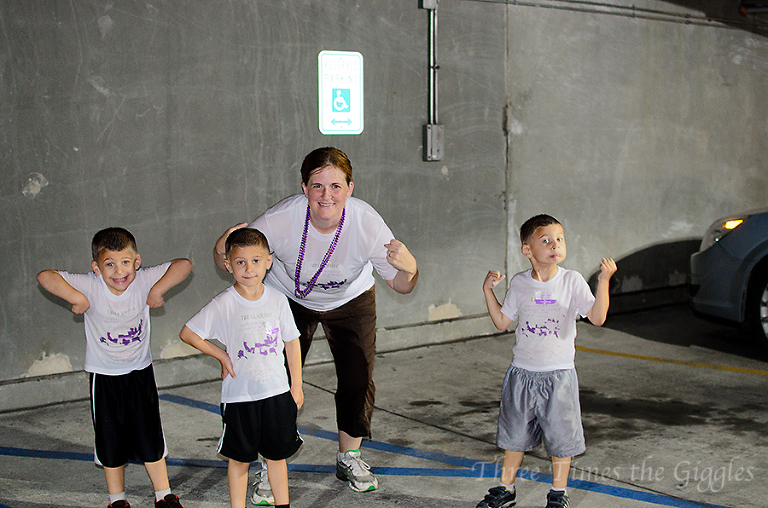 That’s when I had Laura snap this picture of the kiddos and me, in our team t-shirts! The bead necklaces were given out at the walk this year, and I thought it was a fun addition! Walkers wore purple for each preemie they were walking for, red for a full-term baby, silver for a loss and blue for birth defects. And because our shirts are hard to read, here’s what was on them! Fun, huh? I had to give you all a shout out on it! No word yet on which team won the t-shirt contest, but if mine was chosen I’ll definitely let you know. The woman running the t-shirt drop off table loved the map and said she’d never seen one like that before. Ok, back to the walk… So the walk was supposed to begin at 10am, but at that time it was pouring buckets! The stage area where everyone was gather is covered, so at least we were able to stay dry. After 30 minutes of listening to the band play and watching my kids dance (they were having a ball!) Laura and I decided it looked like the rain had let up and the storm had finally passed by. Lily looks super impressed with all of this, doesn’t she? Ha! As you can tell, most of the teams were still waiting a bit longer before venturing out for the walk, and it seems they were wise to do that… While it was only sprinkling when we started, we got about 1/4 of a mile into the 1 mile loop and the skies opened up again! Laura held her large umbrella (so glad she brought one!) and pushed Lily in her stroller, and I walked with the boys. We were soaked by the end of it, but we had a ball! The wild weather continued off and on all day, complete with tornado warnings in two of the neighboring counties, hail, power outages and lots of rain (therefore, lots of water in our basement). 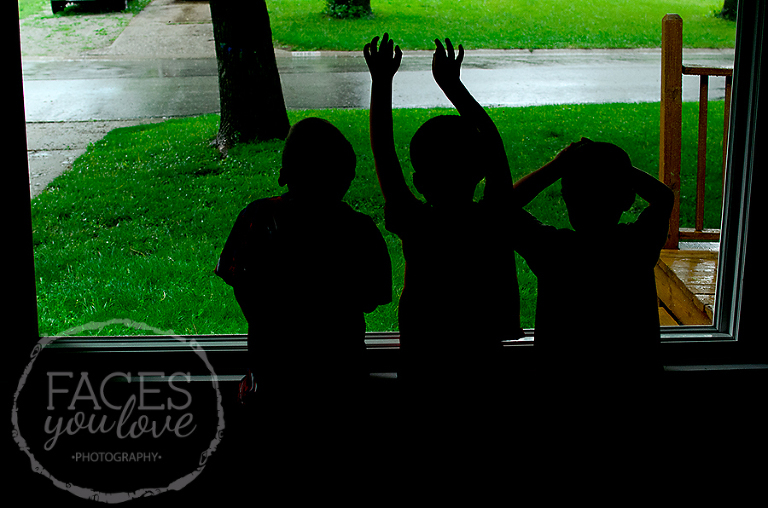 The boys loved watching the storms rolling through, and even got excited at the prospect of maybe having to go into our basement. At least my kids aren’t terrified of the storms right now! Nick had far more fun with the evening storms, as he was still at the church when the tornado sirens went off there. The evening service hadn’t let out yet, so a couple thousand adults and kids had to take shelter for 30 minutes! Nothing major ended up happening, but Nick and I were marveling that we’ve been here for over 7 years and this was finally the first time he’s had to interrupt children’s programming and usher all of the kids to the shelter area. 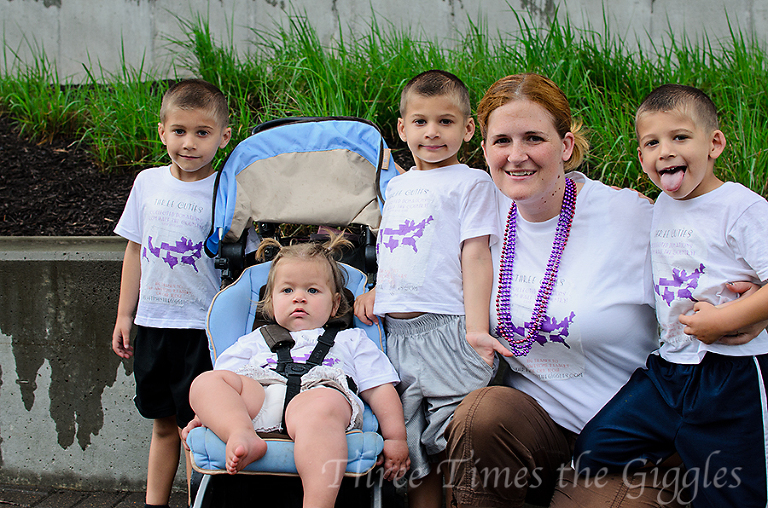 Let me wrap this up, by saying a big Thank You to all of you for supporting our March for Babies team again this year! This was our 5th year walking, and you all helped me reach my unusual 25 state goal this year, and raised $625 in the process! Thank you, thank you, thank you!